with DCE's new traveling trophy. After traveling to the United States this September and earning a sixth place finish at the Drum Corps Associates World Championships, the Kidsgrove Scouts came away Saturday with their very first Drum Corps Europe (DCE) Championship. Celebrating their 100th anniversary in 2010 with a production titled "Heist of the Century," Kidsgrove topped a field of 18 corps at Parkstad Limburg Stadium in Kerkrade, the Netherlands with a final score of 88.65. 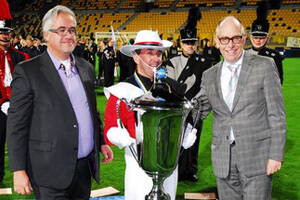 The Kidsgrove Scouts are only the second English corps to win the DCE Championship and the first since the Senators won back-to-back titles in 2007 and 2008. "Wow! Thanks again to everyone for your messages of support! It means a great deal. What a season!" the corps posted on its Facebook page following Saturday's events. Turning heads in their very first appearance at the DCE Championships, The Company of Barnsley, South Yorkshire, England finished just under a point and a half from the top spot with a score of 87.20. 2010 Drum Corps Netherlands Champions Juliana finished third (85.05) followed by the 2009 reigning DCE Champions Jubal with a score of 84.25. Winning the Cadet Class was Dutch corps Johan Friso with a score of 79.95, passing up 2009 Champions Jong Jubal (2nd, 78.55) and the 2005 Champs Jong Beatrix (3rd, 71.85). Associated with the Juliana Drum and Bugle Corps, this was Joahn Friso's first title and the highest finish for Juliana at the DCE Championships ever. View a complete recap of scores on DrumCorpsEurope.org. Photo courtesy Drum Corps Media.